Perfect for up to 10 people, great for an office to share or for a family to enjoy together! 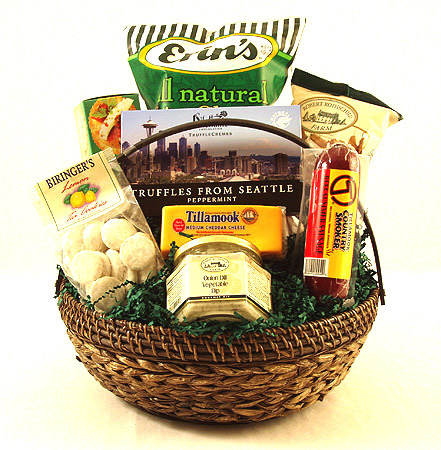 An impressive gourmet food gift basket that is a grand presentation, this gourmet basket includes Tillamook Country Smoker Beef Summer Sausage, Tillamook Cheddar Cheese, Elki Crackers, Elki Bacon Blue Cheese Mustard Dip, Seattle Sinsation Pretzels, Erin's Popcorn, Dilettante Truffles from Seattle, and Biringer Cookies. Something for everyone and sure to be a winner with any crowd!